We do not have to assume the large-scale removal of garrison limitanei (lightly armed border units in Late Roman armies which were used to pin down attackers until more heavily-armed reinforcements could arrive). The new work on coastal defences and the fact that the barbarians stopped at the Wall suggests that for the moment the frontiers had held. In relation to this, the mention by Gildas of the provision of exemplaria armorum makes it clear that the Britons were being instructed on the local manufacture of equipment which up to now had normally been supplied by the state ordnance factories, especially those in the Danubian provinces. 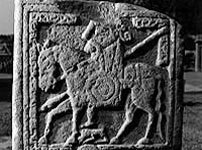 If what Gildas describes as the legio being withdrawn when the second Pictish war took place was indeed the same force that had been sent by Theodosius the Great to deal with the first Pictish war in 389 or 390, then it may have been in Britain much longer than was intended. There is a minor problem with this in that with the exact form described in the Notitia Dignitatum (a list of dignitaries and their areas of responsibility in the Late Roman empire at about AD 395), the force must date from 395 or later, since it includes a unit named after Honorius (equites Honoriani seniores). However, the possibility must be allowed that this unit was a later addition or the result of a reorganisation of an existing force. If it was, then a taskforce becoming almost a fixture provides one possible answer for that presence of a comes Britanniarum in the Notitia Dignitatum over which much ink has been spilt. The Notitia army, nine units of comitatenses, looks just like a taskforce. If there was, therefore, a campaign in 398 (following the defeat of Gildo) by the Romans against barbarians who were threatening Britain, it is likely it was a sudden decision to seize an unforeseen opportunity once forces had been freed up in Africa. Stilicho may have harboured long term ambitions for a major offensive in Britain, but the moment was generally inauspicious. A withdrawal of as many troops as possible in 399, which was intended to be temporary, seems likely, coupled with a further reorganisation of the coastal command. Such a policy is especially convincing if an unexpected success had sapped barbarian confidence. Even so, Stilicho's withdrawals may not have been as drastic as has often been thought, even though he had to prepare to deal with Alaric and his Goths, who were always a major thorn in his side. So by the start of the fifth century, the scene in Britain was one of steadily declining professional troop numbers combined with a probable increase in the hiring and settling of barbarian laeti to make up the difference. The same practise was standard in Gaul, where it is better attested and was practised for a much longer period of time. 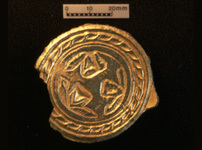 These laeti, mostly Saxons it seems, have left grave goods and pottery behind them where they settled and died, usually in settlements that were located immediately outside the fortified walls of the remaining Roman cities. Despite an apparently stable picture in Britain, the troubles that had been inflicted upon the empire had clearly taken their toll, and were continuing to do so. The official import into Britain of new coinage in large quantities came to an end in 402, although it was still being produced internally in much smaller quantities. 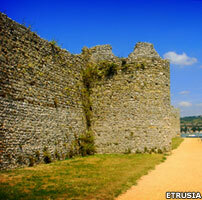 In 405 more troops were withdrawn from Britain to form part of the Roman army that defeated the Goths in northern Italy. In fact, Stilicho's attention for much of his period in office seemed to have been spent trying to outmanoeuvre Alaric and his Goths, or at least limit their scope for any successes against 'his' empire. In the end he lost his battle, assassinated by an opposing faction from within the imperial court itself. The Late Roman administration was often its own worst enemy. The British provinces themselves were relatively isolated by 406. Their landowning classes had not taken part in the trend that was popular on the Continent, where the nobility were becoming deeply involved in imperial administration. The British aristocracy also greatly feared an invasion from across the Channel by those barbarians that were now crossing the Rhine and invading Gaul. They constantly lacked support from the empire in their fight against barbarian incursions, so from 406 the remaining soldiers, always the source of such support, raised a series of their own claimants to the throne. Initially this was both for the throne of Britain and the empire but, after 409, British ambitions were greatly curtailed. The timing is uncertain, but almost at the same time as a wave of barbarians crossed the Rhine on the last day of 406, Stilicho detached the British diocese from the western imperial government. What followed from these two events was to prove fatal for Britain as part of the Roman world. There was already some sign that the situation in Britain was tense. Irish raiders were attacking the south coast, although Stilicho's defensive arrangements seem to have accurately assessed this probability. However, the Gothic Wars of 402-403 and 404-405 already meant that imperial troops were concentrated on Italy, so Gaul and Britain were perhaps more thinly defended than normal. In the same year - 406 - Honorius urged the provinciales of the west to take up arms in their own defence and offered freedom to slaves who volunteered to join them. Seeing the writing on the wall, the army in Britain first elevated a soldier named Marcus, but they murdered him when he didn't meet their expectations. Next they elevated a Briton named Gratian, who appears to have been a civilian and was probably a member of the Romano-British upper class. During the chaos in Gaul, as Franks, Alani, and Romans fought Vandals, Alani, and Suevi near the Rhine, Gratian's four month reign came to an end with deposition and murder. His main failing seems to have been his refusal to cross the Channel to defeat the invading barbarians before they could launch an invasion of Britain. This is what the ruling classes in Britain most feared, and they expected to receive little help from the imperial government. Seeing the division and confusion caused by the barbarians in Gaul, the army of Britain may have believed that Britain should not stand alone but should be part of a united Gallic province, as it had been previously under Clodius Albinus (193-197) or Magnus Maximus himself. 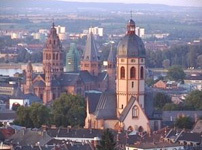 Barbarians in the form of the Vandals, the Suevi, and the Alani crossed the Rhine en masse at Mainz (above) on the last day of AD 406, bringing chaos to Roman Gaul. They were attacked by Frankish tribes who had already settled on the west bank of the Rhine, and faced defeat until the Alani came to their aid. The very fact that they believed they could make an attempt of the traditional type on the Continent suggests the army in Britain felt its own strength still to be sufficiently great to overawe and win the support of the surviving Roman and allied forces in Gaul and Germany, or to defeat them if they remained loyal to the imperial government at Ravenna. This does not support the view that Britain had been drained of troops by Stilicho in 401 (or if it had been, that they had not been replaced). When the Britons selected Constantine III, Sozomen, an historian of the Christian church in the fifth century, thought it was because the great name he bore suggested that he would win good fortune in any attempt to grasp the imperial throne. Good fortune played an important part in how Roman troops viewed their leaders. Whatever the army's motives, Constantine moved swiftly from Britain into Gaul before the barbarian horde of 406 could take the coast, sending officers in advance of him to secure the support of remaining Roman or allied forces. In the event, the barbarians turned south, and Constantine's forces instead faced some stiff fighting against loyalist forces, which they overcame. 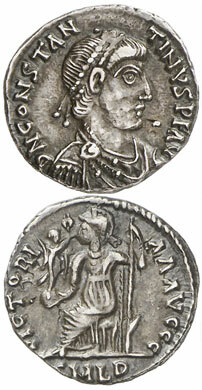 Constantine quickly took over the administration of Gaul and set about repairing the Rhine defences. While he could not bring under control the barbarians who were moving about in Gaul, he sent his son Constans as Caesar and his British general Gerontius to secure Hispania in a swift campaign. While, shortly before his own execution, Stilicho tried to stir up some barbarians in Gaul against Constantine, by the end of 408 or the start of 409 Honorius was forced to recognise Constantine as Augustus and that year held the consulship jointly with him. It looked for the moment as if the army had made the right choice. 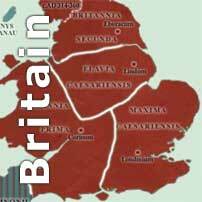 They had again made Britain part of a united Gallic prefecture under firm Roman control. In Constantine III they had a properly legitimised emperor who owed his elevation to them and whose Continental forces contained senior officers from their own numbers. There is absolutely no hard evidence that Constantine withdrew the garrison from Britain at this time to reinforce himself in southern Gaul. True, he probably took some frontline army units with him, but it would make the most sense if he tried to balance the disposition of his forces in the traditional way, in order to secure all of his borders and territories. It would make no sense to deplete Britain at a time at which he drew a large amount of support from the island. However, while Trier had been the seat of Roman central power in Gaul for more than a century, Constantine found it had been moved very far south, to Arles, a transfer that had probably only just happened as a result of the barbarian invasion of 406. The transfer was as yet incomplete - the mint at Trier continued to produce coins both for Constantine and his successor, Jovinus. The result, though, was that Constantine's government was much more distant from Britain that it would have been for Magnus Maximus. It doesn't seem to have taken the administration in Britain long to see that Constantine's Gallic empire was now very much focussed on the Mediterranean rather than the north, something the Britons would not have been overjoyed to learn. Other problems further complicated the issue. With Constantine now the recognised joint Augustus, the wandering barbarian tribes entered Hispania and disrupted his empire. Gerontius rebelled and raised his own puppet emperor, beginning preparations to march north and challenge his former commander. At the same time, (late 408) barbarians in the form of Saxons launched a serious and destructive attack on Britain. Constantine probably did not have the troops to spare to deal with this emergency because when Gerontius revolted the bulk of the army was with him in Hispania.